The sun illuminates the broad tidal wetland of the Salmon River as I paddle my sea kayak steadily upriver on a brilliant October afternoon, an interlude between the rainy fall days of coastal Oregon. The freedom to glide over even the shallowest water and encounter there nature undisturbed feeds a life-long love of hand-powered craft for me. Tufted hairgrass and Lyngby’s sedge that cover the marsh over which the tide rises and falls are mixed gold and green now, contrasting with the dark velvet of Sitka spruce and western hemlock forest on the bordering headlands. The rich array of marine and freshwater animals in this river estuary is very different from the Rocky Mountain and Great Plains streams that I know well. Dark green-brown Dungeness crabs are easily visible in the clear water as I glide on the incoming tide, scavenging across the bottom four feet below. I rest a bit after a few miles, middle-aged arms and shoulders aching from the exertion. Double-crested cormorants fishing along this tidewater portion of the river, looking almost reptile-like with their black scaly feathers, startle me from my reverie as they rise from their small groups, beating the water on each downward stroke of their powerful wings as they take off low across the water. Curious harbor seals follow me miles upriver as I paddle, and my throat catches in surprise when one pokes its head above the water just ahead to inspect my boat as I approach. No such marine mammals ply my home rivers. But the main event at this time of year is the upriver migration of spawning adult Chinook salmon, the behemoths of the five species of Pacific salmon in North America, which in this river reach 40 pounds. In the headwaters last week I witnessed a large female Chinook digging her nest in a shallow swift riffle, turning on her side to beat her tail and lift gravel to winnow away the silt, in preparation for releasing and then burying her pea-sized salmon-colored eggs which will incubate through the winter. The males, skulking in nearby pools, somehow know just when to slip by her side to release their sperm as she releases her eggs. How would she have avoided the brown bears that once must have fished along these streams? I wondered how long her frayed tail, now revealing white cartilage fin rays beneath tattered skin, would last as she gave all the energy her body had stored to bury her eggs and then die, as do all the Pacific salmon. During this sabbatical year from my work on ecology and fish conservation biology as a professor at Colorado State University, I seek to see and understand new rivers and streams, and learn new things to enrich my teaching and research. But more than that, for myself, I want to understand why rivers are important. Ecologists like me study groups of species, which we call ecological communities, and their essential connections with their environment and other species that share it. Thirty five years of study have led me to a deeper understanding of these connections in streams. But beyond this, what do we know about our own connections to rivers and streams? At the heart of the matter, what is essential for us here? Do we really need these places? Do we care about them? And, if so, why? I start from the basics that I know well. Rivers here are important for salmon, and many people like to see, catch, or eat salmon like the Chinook and coho that return to this river. Many prefer wild salmon over the farmed salmon reared in sea cages in far-flung places like Tasmania and Chile. Yet more than 200 wild populations of salmon in the Pacific Northwest are in trouble, and fishing for many of them in the ocean and rivers is restricted or closed. Why is this? The reasons are many, but scientists who study wild Pacific salmon now understand quite clearly that salmon need every part of these rivers and estuaries, every nook and cranny, from among the smallest trickles to the largest rivers, if their populations are to be resilient and robust enough to be fished by us, and to withstand the more variable climate that is arriving. 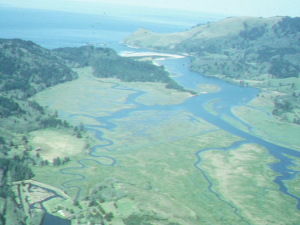 In the Salmon River estuary, local dairy farmers built levees in the early 1960s to prevent high tides from flooding the marsh, and installed one-way gates on the mouths of streams that meandered across it. They wanted to keep brackish water from backing up into these wetlands so they could create more pasture for grazing cattle. At that time, fisheries biologists who managed the salmon were not so concerned about this loss of tidal marsh. They thought that most of the young Chinook and coho salmon that survived to become the returning adults were those that successfully competed for good feeding positions in upstream freshwater reaches and grew large, and then migrated to the ocean all at once as fingerlings called “smolts”. They thought that the losers that drifted downstream into the estuary as small fry were lost and simply died. Biologists named these unfortunate waifs “nomads”, apparently not appreciating that we humans thrived with this lifestyle for hundreds of thousands of years. However, through literally decades of work by scientists like Dan Bottom (NOAA Fisheries) and Kim Jones (Oregon Department of Fish and Wildlife) in the Salmon River we now know that there is more than one career path for salmon. Even within one population of Chinook or coho salmon in one fairly small river like this, juveniles can have many different “life history strategies”, which collectively spread out and make use of virtually all the habitat. Bottom and Jones found four different lifestyles of Chinook salmon and six of coho salmon, based on an exhaustive program of sampling and analysis over the last decade. For example, some small coho nomad fry emigrate downstream into the river estuary and then move upstream into the meandering tidal channels to rear for a few weeks to several months, growing quickly on the abundant small aquatic invertebrates before going to the ocean. Some coho juveniles even move far upstream into the tiniest freshwater headwaters of these small estuary streams, and live in channels only a foot or two wide. Based on early shreds of evidence, salmon biologists started removing dikes and tide gates in the late 1970s to reconnect the river to the marsh and these small tidal wetland streams, and now about a third of the adult salmon returning each year bear a chemical signature in their ear bones that show they reared in this estuary as fry. In some years nearly half the salmon do. The message seems clear. Salmon evolve to use virtually all parts of a watershed, including the entire estuary. We can either dike and drain these wetlands, or we can have these diverse lifestyles in our salmon populations, but not both. Why care about these lifestyles of salmon? What is really important is that these estuarine-rearing salmon can be critical to sustaining their populations, and our fisheries, if landslides temporarily block or cover habitats upstream, or if a Mount St. Helens-style volcanic eruption inundates them with ash for several years before recovery unfolds. Salmon populations that have survived these apparent catastrophes over the eons evolved diverse lifestyles. Those that did not died out. And as our climate becomes more variable, this diversity of lifestyles in our salmon portfolio is what biologists believe can also buffer the salmon, and our fisheries, from future climate disturbances. Some will do better in warmer years, or those with more rain, and others in cooler or drier years. Ecologists who study Alaskan sockeye salmon populations in the several hundred relatively pristine streams that feed Bristol Bay showed that if all these different lifestyles were lost and only one homogeneous population remained (such as one hatchery stock), the number of salmon returning would be twice as variable year to year. This would cause 10 times more fishery closures, ruining the livelihoods and communities the salmon support. Through forward-thinking efforts like these, scientists and managers are developing better-informed management, aimed at keeping all of the parts as we not only tinker with habitat, but make wholesale changes to climate variability. My fellow ecologists have found that rivers, and the salmon they support, are also important to the trees beyond the river banks, and that these forests feed back to create more salmon. Salmon eaten by bears and eagles, and carcasses that naturally wash onto the floodplain in the winter floods, are now known to return tons of nitrogen fertilizer that originated in the ocean back to entire watersheds, and to literally fertilize forest trees. Without healthy salmon runs, forests suffer. In turn, the huge western redcedar and Sitka spruce growing along streams (and fertilized by salmon) eventually die, and many fall into the streams or are brought in by landslides. They create log jams that trap the gravel from these natural landslides, which is needed for salmon to spawn, and keep it from being washed downstream too quickly. The jams also form pools to shelter young salmon from winter floods, and to provide places for them to live when streams are very low in the summer. In an even more complex cycle, maggots that feed on salmon carcasses in Alaska turn into blowflies that pollinate streamside flowers, and so the flowers time their blossoming to coincide with salmon runs along different streams. These webs of predators and prey, of pollinators and plants, of suppliers and users of resources, link rivers and riparian landscapes across the land-water boundary that we now realize is ecologically transparent. Paradoxically, some of the most striking examples of these important linkages come from a stream 5000 miles away, in northern Japan, from research that we and our Japanese colleagues conducted over the last 15 years. Iki ma sho! (Let’s go! ), I cry urgently to the Japanese forest workers and graduate students as we arrive at the stream with the truck load of steel-pole greenhouse frames and long bolts of fine mosquito netting. Bright green fiddleheads of emerging ferns poke through the brown litter on the forest floor, and the sun shines brightly through the bare branches of just-leafing maples in early June here in southwestern Hokkaido, the northern island in the Japan archipelago. We set to work assembling the U-shaped frames and push them upright into the soft gravel along the stream banks. We then attach side and top rails to create what looks like a large segmented caterpillar over the stream, about 14 feet wide and 7 feet tall, snaking 60 yards through the forest. Our crew of a half dozen unfurls the fine mesh and leads it through the maze of trees to completely cover the greenhouse frame, one bolt for each side and one joining them across the top. We secure it to the frame with plastic clips, stake it to the ground, and let more mesh drape over the upstream and downstream ends to cover them. Very soon, adult insects such as mayflies and caddisflies, struggling to emerge from the surface of the stream where they have lived as aquatic larvae, fly up and congregate under the top of our stream veil, most eventually escaping through vents we cut in each end to release them. Forest caterpillars of all stripes, and several kinds of ants, drop onto the greenhouse and crawl down the sides instead of falling into the stream. Shiny black ground beetles incessantly wandering across the forest floor must detour, even though some would have tumbled into the stream from the banks. Tired, we pack up tools to leave, brushing the forest leavings off of our clothes and happy to be free from wet waders, but satisfied to have finished the second greenhouse today. It will take three more days to build all eight we need for one of the largest field experiments ever conducted in, and over, a stream. This unlikely experiment to cut off the insects emerging from the stream to the forest, and falling from the forest into the stream, was the vision of my friend and colleague, Dr. Shigeru Nakano of Hokkaido University, who was killed in a tragic accident in the field in 2000. A keen observer and thinker, Nakano asked the key question “Why is the stream important to the forest, and vice versa?” Not long before, he and a colleague had found through literally tens of thousands of careful observations and measurements that fully a quarter of the food energy that birds living in this streamside forest need to survive is supplied by these emerging aquatic insects. In the opposite direction, nearly half of the food energy that trout and other fish in the stream need to survive is supplied by terrestrial insects that fall from the forest. Most ecologists had no idea that these “subsidies” of insect prey that crossed the stream-forest boundary were so important. When Nakano’s team simply cut off these insect movements with fine-mesh greenhouses, the native Dolly Varden charr (a type of trout) that they enclosed in the stream sections beneath the greenhouses, being deprived of half their food which fell from the forest, shifted to scooping up the tiny insect larvae on the stream bottom. In turn, because these insects graze algae from rocks like so many tiny buffalo, the plants blossomed into large clumps and turned the streambed a dark green. In another study, when Nakano’s team created a ¾–mile long greenhouse snaking through the forest, they found that most streamside spiders and foraging bats, which also rely on emerging insects like birds do, left or died because their food supply from the stream was cut off. We and others have conducted more experiments like these in Japan and other places worldwide, and most often half or more of the stream and forest animals disappeared, simply by blocking these little-noticed movements of tiny insects between stream and forest. These were bigger effects than anyone imagined. And now I take comfort in finding these universal linkages along every stream I visit around the world, in mountain streams of Colorado and Wyoming, in Catalonian rivers of northeast Spain last June, and here along Oregon coastal rivers this fall. I have learned to walk slowly, to still the ever-present inner din, and allow myself to be entranced by the shifting swarms of recently-emerged midges, silhouetted in the late afternoon sun shafts through the riparian alders. I take pride when I am the first to notice the long-jawed spiders that feed on these emerging insects, resting on the margins of last night’s webs made visible by the morning dew, and strung nearly horizontally on branches and grasses bending over the water. And although Nakano died too young, I am heartened by the efforts of many ecologists to follow the clues he left us and understand the effects we humans have on these linkages between streams and riparian forests and grasslands. We now know that birds, bats, lizards, and spiders all rely on insect emergence from streams to sustain them, especially through seasons when food is scarce in the riparian. We also know, for example, that introducing nonnative trout into streams for sport fishing can remove one in every three insects that would have emerged, and so reduce the food supply for the forest animals. Likewise, allowing uncontrolled grazing by cattle on riparian grasses and shrubs along rangeland streams in the West can reduce terrestrial bugs falling into streams that are critical to trout, and result in only half the weight of trout compared to streams with better grazing management. The important point is that intact streams are critical to feed the animals that live along them, and healthy riparian zones are essential to feed fish in streams. However, despite all this new knowledge, I know that not many people may see and understand the hidden ecological connections through the movements of salmon, and stream and forest insects, which weave rivers into the rich tapestry of our landscapes and link forests with streams across the reflective boundary. If we had known this a century ago, would we humans have so relentlessly dismembered streams? With an accelerating pace after World War II, we straightened, dammed, and diverted them, and pumped dry the groundwater that feeds them, often cutting off sources of nutrients from fish migrations, and insects that feed riparian forests and grasslands. We also cleared riparian forests and overgrazed grasslands, removing critical sources of insect prey for fish, and logs that shape stream habitat. In North America, the dividends of these investments have included not only the economic wealth from agriculture and water-based commerce, for example, but also driving to near the brink of extinction more than a third of the species of freshwater fishes, half of the crayfishes, and three-quarters of the freshwater mussels of our continent, which has the greatest diversity worldwide of all of these groups. As long as we could find more clean water, or eventually make our dirty water clean enough to drink, we thought that we had extracted the value we needed from many of our streams. But, beyond the utilitarian values of water to drink and carry away our sewage, to grow crops and support our cities, is there something here that is essential to our daily lives, our health and well-being? Why do we care whether our rivers are dirty or channelized, or dry up altogether? I stand at the trailhead atop the high ridge of Cascade Head, a wild headland protected within several forest preserves which border the Salmon River estuary, ready for the hike that descends to Hart’s Cove carved into the cliffs along the ocean. Switchbacks lead me ever deeper down through the old forest, past huge columns of Sitka spruces with lower branches coated with chartreuse mosses, trees so large at the base that they dwarf my 4-foot walking stick when I take their pictures. I feel like a tiny creature among these forest druids, some now fallen and toppled into the thick duff by wind storms, now nurse logs for small hemlocks that sprout up from their sides, reaching for the new sunlit gap aloft. The forest drips as drizzle and coastal fog condense on leaves and needles, and by late afternoon when I return dusk is already making its quiet march over the hummocks along the forest floor. The trail crosses two small streams that run west to the ocean, parallel with the Salmon River, both of which descend to the cliffs and freefall a hundred feet into the sea. As I make the long hike back uphill from watching the surf play tag with the cliffs in Hart’s Cove, I stop to rest, and realize that I can hear the first stream in the distance, the broad range of frequencies that mark the sound of water cantering over rocky riffles and cascading into small plunge pools. The lilting and laughing tones are reminiscent of family conversation not quite heard as one awakens from sleep. How can one not want to move closer, to see the stream, after hearing this sound? The scientist in me wants to conduct an experiment to test how many people would choose to walk in which direction when given this choice. Is this alluring sound part of what draws us in and connects us to rivers? Many writings, from those of the Psalmist to the great conservationist Aldo Leopold, refer to our innate preference for the sound of running water. More recently, researchers in Spain, England, and Korea have discovered that people prefer the sound of streams over all other natural and human-made sounds tested, and other scientists found that these sounds induce a distinct change in human physiology that causes relaxation. Others write that sound connects us more completely to water than sight, because we must immerse ourselves in it, and hear it out. I start very slowly towards the sound, straining a bit in the dim light to see the rushing water. But even before it comes into view through the salmonberry along its banks, I feel the presence of the stream and riparian, as the air suddenly becomes markedly cooler and more humid, even though this old-growth forest is everywhere cool and humid. Ecologists report that this moderate microclimate is essential for many organisms that survive only here, including amphibious salamanders that live along streams, and the diaphanous and ephemeral adults of aquatic insects like mayflies that live only a few days before mating above the stream. But isn’t this riparian shade and cool microclimate also essential for us as humans, especially in hot, dry climates? Perhaps we gravitated toward it more during Paleolithic times, for shelter and solace, but that preference continues even now when we lay out paths for biking and walking, and vantages for Sunday picnics. As I move farther and the stream comes into full view, I recall how the ever-changing glimpses and vistas of streams and rivers also allure, often from many different distances. In his 1984 book Biophilia, Harvard evolutionary biologist and writer E. O. Wilson wrote of “the right place”, describing the characteristics of habitats selected by early humans. Savannas with scattered trees, promontories offering lookouts and shelter caves, and streams and lakes (that is, water courses) were the three key ingredients he found, summarizing the work of other ecologists and anthropologists. More work since then by environmental psychologists has revealed that humans have rapid and innate preferences for certain landscapes and riverscapes, and so will gravitate toward them intuitively. One of the most important findings, by Rachel and Stephen Kaplan of the University of Michigan, is that the inherent “mystery” in a landscape, the promise of more information if one ventured further, around the bend, is an important predictor of preference. Rivers and streams embody this essential quality of mystery more than nearly any other natural environment. Streams can also contribute in essential ways to normal healthy development of our children, and to our own health and well-being as adults. Who has not seen children make small dams of rocks in small streams, just to play in the water rushing over them? In his oft cited book, Last Child in the Woods, Richard Louv coined the term ”Nature Deficit Disorder” to describe the malaise that our cloistered children face because we prevent them from playing outside. Humans heal faster from ailments when they contact nature, it reduces ADHD in children, enhances quality of life for disabled children, and promotes creativity on which our economy depends, he argues. Our colleagues, the geologists who study how river channel networks form, have calculated that it takes about 100,000 of the smallest streams to produce one Mississippi River. This means that small streams are the closest aquatic environment to every child and adult on the planet, the closest place where they can experience these life-enhancing benefits, be drawn to their sounds and sights, and wonder at the rich ecological connections and complex biodiversity of these ecosystems. Most of us are not privileged to live on the shores of an ocean or a lake. But small streams or rivers are within walking distance of nearly every child, and if restored, their beauty and complexity can rival that of any coral reef or tropical rainforest, right in our own back yards. I have been privileged to spend several months of my sabbatical in western Oregon, more than half at a writer’s residency at the Sitka Center for Art and Ecology on Cascade Head near the Salmon River, exploring these tangled connections among rivers and organisms, landscapes, and humans. I have spent time not only writing, but also hiking along streams and rivers, watching and listening intently to them, pondering why they are important, and reading the writings of others. Ultimately, I believe that our connections to them, and why we care about them and want to be near them, come from the rich human emotions that stir and the deep human needs that are fulfilled when we seek their counsel. In few other places in our daily lives can we find the full range of mystery and wonder, and experience not only deep awe and reverence, but also the most powerful of human emotions beyond the reach of language. David Orr writes that the topic of love for the creatures and environments that we study is taboo among natural scientists like me, and even social scientists. One can be banished from the academy of serious scholars for such excessive displays of emotion. He then hastens to add that, even so, this biophilia needs to become a legitimate subject of inquiry and practice. In short, we are only beginning to understand how this deepest emotion causes us to gravitate toward those habitats that ensure the survival of organisms we care about, like salmon and birds; habitats that embody those processes on which our own lives depend, like clean water and the capacity to heal our minds and souls. Orr’s case rests on assertions by Stephen J. Gould and others that we will not fight to save what we do not love, and we will not love that for which we have no visceral contact and no emotional bond. Yet, I would go farther. Because our emotions toward rivers are so deeply held in our subconscious, beyond the reach of language, I propose that we will not save what we do not even understand that we love. During this writer’s residency I have felt like there is something more, and much deeper, about rivers that I have been striving to grasp, way beyond the science of it. And so what if I take that risk, to try to articulate what I love? It must include the respite of the cool riparian in the evening after hot summer days when camped far from home for research. On crisp fall mornings there is the jeweled dew falling cold on your neck from the willows, and the steaming mist rising over frost-laden streamside grasses as they are bathed in the rich new sunlight. I love the vistas of rivers when I drive along their valleys anywhere in the world, and the ever-changing glimpses of stream reaches as one hikes to meet them. But even more, I seek their murmuring, lilting half-voices that can calm the inner half-voices of doubts and fears in one’s soul. Certainly this love must include the anticipation of the organisms that I will see there, so surprisingly colorful and intricate and complex, and often so well adapted to life in the relentless pull of the flow, ever seeking the oceans. I am drawn to the movement of the stream itself, and when I wade in, by the feeling of raw power against my thighs. But deeper even than these, I love the mystery only partly grasped, that the river flows here, but at the same time everywhere, a gathering of waters from places beyond and unseen. And in this mystery, I realize that the river is not a thing, not an object or even a place, but a journey, so like life itself. At the dimming of the day in early November at the end of my stay, I am again drawn down the hill to Knight’s Landing to listen and watch along the Salmon River and its estuary, now at low ebb tide. A light rain falls and a bitter wind blows across the valley, and yellow-brown alder leaves stream earthward beneath the lowering clouds. A Great Blue Heron strikes its silent pose, fishing in the shallows along one bank, and a seal’s head makes a V in the sky’s soft silky reflection as it proceeds upriver. Along with the love and respect, I feel a sense of mourning for the river, of what has been already lost by our influence, and what we might have lost forever had not committed people cared enough to restore the hidden connections. Suddenly, I hear the faint caviling of Canada geese far in the distance, the goose music that Aldo Leopold so loved, but the birds are beyond the reach of my vision in the failing light. Then, despite the cold, I feel a thrill as just beneath the low clouds the ragged V comes into view, headed downriver, their cacophony growing louder. Suddenly, the flock whirls to the forest on the opposite shore, circles back, and all the geese set their wings to land, as if by some silent pact. They settle, wings flapping, onto the tidal flat, perhaps to forage from the river’s bounty. As I turn to leave, I recall Leopold’s lament, about the loss of wild things he so loved and hoped to leave his children. “And when the dawn-wind stirs through the ancient cottonwoods, and the gray light steals down from the hills over the old river sliding softly past its wide brown sandbars – what if there be no more goose music?” Surely, this sense of loss is the best measure of the things we love. And so, as I walk back, I ponder the same question for the river itself. Dr. Fausch is a Professor in the Department of Fish, Wildlife, and Conservation Biology, where he has worked since 1982. He earned his B.S. at the University of Minnesota in Zoology, and his M.S. and Ph.D. in Fisheries Ecology at Michigan State University, followed by postdoctoral research at the University of Illinois. Research in his laboratory is aimed at helping fisheries and aquatic resource managers and ecologists solve problems related to nonnative species invasions, the decline of threatened native species, and land uses like logging, grazing, and agriculture that can degrade streams and their riparian zones. He has conducted collaborative research throughout western North America, and in Japan and New Zealand. His work is the subject of the documentary film RiverWebs, which has recently aired on PBS. Fausch was recently awarded the first International Fisheries Science Prize by the International Council of Fisheries Societies, to be awarded every four years at the World Fisheries Congress. He and his colleagues were also honored with the U.S. Forest Service Rise-to-the-Future National Research Achievement Award for 2008.